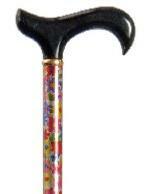 A cheerful cane for everyday use. The height-adjustable aluminium shaft has a multi-coloured, modern floral pattern. It is fitted with a smart, wooden derby handle in black lacquered hardwood and a black non-slip rubber ferrule. Ferrule diameter 19mm.